Like any other journal we love a good story at Professional Imagemaker and one popped up almost by chance while chatting with sports photographer Paul Zammit Cutajar at the Convention. Paul, you may recall, provided images from the soccer World Cup in a recent issue. Paul also covered the 2012 London Olympics but it transpires that his connection with the Olympics started four years before he was born. 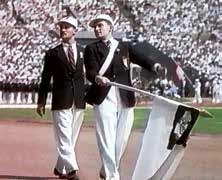 His father, Francis Xavier Zammit Cutajar was Malta's flag-bearer to the one athlete (sprinter), Nestor Jacono at the1948 Olympic Games, known as The Austerity Games. Not only was he his flag bearer, he was his sponsor, manager and life-long friend. In 1948 rationing was still in operation, the athletes slept in dormitories, ate at the soup kitchen, and yet, spirits were high (coincidentally a certain Michael McNamee was also born - all round a very special year!) The Games opened on 29 July, a brilliant summer's day. Army bands started to play to the 85,000 spectators, whilst international and national guests arrived followed by the Royal Family. As Francis Xavier and his good friend entered the stadium, they received a standing ovation, the crowd, moved with emotion, started crying "Bravo Malta, Bravo Malta". For those too young to remember, or, perhaps don't know, Malta fought a magnificent rearguard action against the Italian Air Force with a pitiful trio of old Gloucester Gladiator bi-planes that they had begged from the British Navy. The brave exploits of the people of Malta during the Second World War led to the rare award of the George Cross (only one of two group awards). Francis Xavier Zammit Cutajar dips his flag to the saluting base in London, 1948. He is leading Maltese sprinter, Nestor Jacono who competed in Heat 1 and finished 5th. Jacono died in May 2014, six years after Francis Xavier. By express instruction of King George VI, the Island of Malta has been awarded the George Cross collectively in perpetuity. In a letter to Malta's Governor (Lieutenant-General Sir William Dobbie) dated 15 April 1942, King George VI awarded the George Cross "to the Island Fortress of Malta to bear witness to a heroism and devotion that will long be famous in history." Dobbie replied: "By God's help Malta will not weaken but will endure until victory is won." It is hard to imagine just how proud Paul's father would have been at this warm reception as he dipped the Maltese flag when he passed the saluting base. After this Lord Burghley began his speech, welcomed the competitors and spectators alike, "a warm flame of hope for a better understanding in the world which has burned so low". At 4pm the King declared the Games open. So, some 64 years later, Paul attended the 2012 London Olympic games, as an accredited photographer. As he went through the motions to access his accreditation, the clerk asked him to go to the IOC offices. Daunted (for fear he was in trouble!) he was met by two jovial officials who asked if Mr Francis Xavier Zammit Cutajar was a relative. They chatted about the Austerity Games and then as a gesture of goodwill placed Paul in one of the prime photo positions for the Opening Ceremony - such is the family that is the Olympic Movement.